It should not be particularly surprising that foods high in fat are consumed every day. From deep fried butter to bacon wrapped meatloaf, where does all of the fat go? Physical measures such as expanding waistline, bulging stomach, etc. are easy to see, but what about people that never seem to gain weight? The less obvious consequences of fat overdose may be more problematic in the long run. People that continuously eat fatty or sugary foods, but never seem to get fat may be harboring more fat that you think. If you’ve ever heard the term skinny-fat or thin outside, fat inside, you know that there are many people who look healthy on the outside, but may have large amounts of fat surrounding their internal organs. 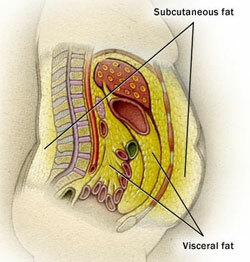 This type of fat is called visceral fat and it’s important to know the difference. In case you were wondering how people maintain their physique while gaining visceral adiposity, the answer lies within exercise—or rather lack thereof, and diet. Fat will accumulate inside the body if the body is not moving. Without movement, there is no means to metabolize the fat. What makes the situation worse is if a large quantity of foods high in saturated fat (butter, cheese, cakes, etc) are being consumed because almost all of this fat is stored as visceral fat. What is non-alcoholic fatty liver disease or NAFLD? Non-alcoholic fatty liver disease (NAFLD) is exactly as the name describes: the accumulation of fat in the liver of people that drink little to no alcohol. How does fat consumption affect NAFLD? Monounsaturated fatty acid (MUFA): MUFAs have positive effects on cardiovascular function and have the ability to decrease oxidized low-density lipoprotein cholesterol levels decreasing blood cholesterol levels.4 They also function as a means to transport fat soluble vitamins and minerals. Therefore individuals diagnosed with NAFLD should increase consumption of MUFAs to incur these benefits. Polyunsaturated fatty acid (PUFA): Polyunsaturated fatty acids (PUFAs) contain both n-3 and n-6 fatty acids. The ratio of n-6/n-3 fatty acids is important as some studies showed that consumption of both of these fatty acid compounds had potential benefits for NAFLD patients. In vitro studies in both animal models and human intervention studies showed beneficial effects of n-3 PUFAs as a treatment of NAFLD in humans as well as CHD.6,7 Both MUFAs and PUFAs have been known to reduce the adverse effects of type 2 diabetes. This is important because type 2 diabetes can potentially lead to NAFLD. What healthy foods are high in monounsaturated fat (MUFA)? What healthy foods are high in polyunsaturated fat (PUFA)? How does weight loss affect NAFLD? Diets low in either carbohydrates or fatty acids will serve to promote long term weight loss; constant and strict diet monitoring is advised.4 A combination of increased physical activity and diet modification is the most effective therapy for NAFLD. Even slight weight loss can be beneficial and could “reverse” the disease to some extent. Is NAFLD associated with other chronic diseases? 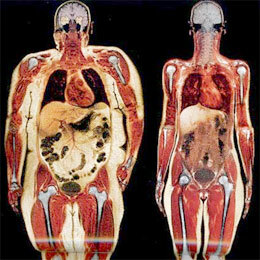 Excessive fat in the bloodstream/circulation of fat in the plasma will cause fat to accumulate in improper places. Free fatty acids can directly affect beta cells in the pancreas and therefore affect insulin production or resistance.9 The cells will become less responsive to blood sugar and resistant to insulin due to the large amount of free fatty acids in the bloodstream. Resistance to insulin will eventually lead to type two diabetes mellitus. Should I go on a no-fat or low-fat diet? When researchers looked at how low-fat diets could affect normal women in terms of overall health, weight gain, and cholesterol levels, it was found that low fat diets did not provide a significant difference.11 Growing children, pregnant or lactating women, and the elderly have different essential fatty acid requirements as well as caloric density, so limiting fat consumption to the point of deprivation can increase the risk of detrimental health effects. In the end, what is most important is the type of fat consumed and not the amount. Healthy fats provide the body with the feeling of satiation that can potentially contribute to weight loss. Absence of fat in the diet may result in fatigue, dry skin and hair, depression, hormone imbalances and weight problems. As stated previously, not all fats are bad. Monounsaturated fatty acids (MUFAs) and polyunsaturated fatty acids (PUFAs) are good examples of fats necessary for normal bodily function. If you need to eat fats regardless, then it would be a good idea to consume these types of fats compared to unhealthy fat alternatives (see food list above for foods high in MUFAs and PUFAs). Of course, as with all things, a balanced diet alongside consistent exercise will go a long way. 1. Klein S, Fontana L, Young L, et al. Absence of an effect of liposuction on insulin action and risk factors for coronary heart disease. The New England Journal of Medicine. 2004;350(25):2549–2557. 2. Després JP. Cardiovascular disease under the influence of excess visceral fat. Critical Pathways in Cardiology. 2007;6(2):51–59. 3. Musso G, Cassader M, Rosina F, Gambino R (2012) Impact of current treatments on liver disease, glucose metabolism and cardiovascular risk in non-alcoholic fatty liver disease (NAFLD): a systematic review and meta-analysis of randomised trials. Diabetologia 55: 885–904. 4. Rafiq, N., & Younossi, Z. (2008). 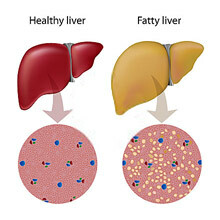 Effects of weight loss on nonalcoholic fatty liver disease. Seminars in Liver Disease, 25(4), 427-433. 5. McCarthy, E. M., & Rinella, M. E. (2011). The role of diet and nutrient composition in nonalcoholic fatty liver disease. Journal of the Academy of Nutrition and Dietetics, 112(3), 401-409. doi: 10.1016/j.jada.2011.10.007. 6. Spadaro L, Magliocco O, Spampinato D, Piro S, Oliveri C, Alagona C, Papa G, Rabuazzo AM, Purrello F. Effects of n-3 polyunsaturated fatty acids in subjects with nonalcoholic fatty liver disease. Dig Liver Dis. 2008;40:194–199. 7. McCarthy, E. M., & Rinella, M. E. (2011). The role of diet and nutrient composition in nonalcoholic fatty liver disease. Journal of the Academy of Nutrition and Dietetics, 112(3), 401-409. doi: 10.1016/j.jada.2011.10.007. 8. Argo CK, Caldwell SH. Epidemiology and natural history of non-alcoholic steatohepatitis. Clin Liver Dis. 2009;13:511–531. 9. Klonoff, D., Buse, J., & Nielsen, L. (2008). Exenatide effects on diabetes, obesity, cardiovascular risk factors and hepatic biomarkers in patients with type 2 diabetes treated for at least 3 years. CMRO,24(1), 275-286. 10. Sookoian S, Pirola CJ. Non-alcoholic fatty liver disease is strongly associated with carotid atherosclerosis: A systematic review. J Hepatol. 2008;49:600–607. 11. Krauss RM, Deckelbaum RJ, Ernst N, Fisher E, Howard BV, Knopp RH, Kotchen T, Lichtenstein AH, McGill HC, Pearson TA, Prewitt TE, Stone NJ, VanHorn L, Weinberg R. Dietary guidelines for healthy American adults.Circulation. 1996;94:1795–1800.